Our covered call writing strategy involves both buying and selling options. Mastering our options trade executions can bring our profit level to even higher levels. We know that a general rule is that we buy at the “bid” (the lower figure) and sell at the “ask” (the higher figure). The difference between the “bid” and the “ask” is called the spread. There may be several bid prices and several ask prices at any point in time. However, only the highest bid and lowest ask are used to calculate the spread. These are the figures you see when accessing the options chains. Utilizing an estimate of the volatility of the underlying stock, a theoretical option value is calculated using an option pricing model, such as the Black-Scholes model. A market maker will then set the bid below this theoretical value and the “ask” above this theoretical price. This is the spread and is determined mainly by liquidity. For example, the highly liquid ETF, QQQ, has bid/ask spreads as low as $ 0.01. This is one of the reasons I require all stocks owned in our portfolios and on our watch list trade at least 250,000 shares per day and options to have an open interest of 100 contracts or more and/or a bid-ask spread of $0.30 or less. Market makers derive their profit from bid/ask spreads. The greater the spread, the more money they make. Playing the spread will decrease their profits and increase ours. If you use a market order when executing a trade, you will sell at the published bid price and buy at the published ask price (this is called “lifting” the offer or “hitting” the bid). This may be okay for the purchase and sale of stocks where the spread is tight (small), but for options, which have a wider bid/ask spread, a limit order is more appropriate and beneficial. This is also called the Limit Order Display Rule or technically the Exchange Act Rule 11Ac1-4. This regulation requires the market makers to show or publish any order that improves the current bid or ask prices unless it is filled. Any order between the current bid-ask spread will improve the market. Most exchanges have a policy in place that requires market makers to fill AT LEAST 10 contracts at the quoted price. For many equities and ETFs the number of contracts required is a lot more and varies from security to security. These players want to buy securities at the lowest price (bid) and sell at the highest price (ask or offer). Now it’s time for Blue Collar Investors all over the world to become annoying and take out our slingshots in much the same way that David approached Goliath. As long as the bid-ask spread isn’t too tight or close together, we place our order between the two quoted prices. If the market maker does not fill the order, he will be required to publish it and then be obligated to fill at least 10 contracts, perhaps more, at that price. Since most of us are selling small numbers of contracts, let’s say up to 5 per stock, it is in the best interest of our friends on the other side to just fill our orders and settle for a lower amount on 5 contracts rather than be obligated for twice that amount and for many more traders. We got them right between the eyes….I mean between the bid-ask spread. In this hypothetical the bid is $2.50 and the “ask” is $3.00. That’s a spread we can work with. As covered call writers, we sell at the bid or in this case, $2.50 per share or $250 per contract. That’s the price at which the market maker wants to buy our options. Instead our offer will be $2.65. That betters the current published offer of $3.00. Therefore, our friend on the other side has a dilemma: Do I fill these 5 contracts @ $2.65 or publish the new, improved offer and be responsible to fill 10 or more as required by the Show or Fill Rule? In most cases, we will get our $0.15 and the market maker will get rid of us. As a general guideline, find the mid-point of the spread and place a limit order slightly in favor of the market maker. This little maneuver will pay for our commissions and buy us lunch at Wendy’s. $75 becomes hundreds, becomes thousands, and becomes tens of thousands and so on. The market makers? They’re gazillionaires anyway…they’ll be alright. For most of us this is redundant, not necessary because the MM is required to fill at least 10 contracts. If this box IS checked the market maker is no longer required to publish our offer and we will lose our leverage when playing the bid-ask spread. A market order should always get filled as you are buying a said number of shares “at market” so you will hit offers until you have a fill. Limit orders will only fill at your specified limit price or better. If you don’t want partial fills you can use the all or none order. They will fill the whole order or nothing. However, this will be counterproductive when playing the bid-ask spread. Blue Collar Investors have certain tools available that will somewhat level the playing field with the market makers. Taking advantage of the Show or Fill Rule is an important one especially when selling a small number of contracts. Although each trade will generate small amounts of cash, over time this will add up to significant dollars that will help to secure our financial future. Unlike David, though, we are not looking to injure our adversaries, just annoy them. For the week, the S&P 500 was up 0.5% for a year-to-date return of 21%, including dividends. BCI: Moderately bullish selling out-of-the-money strikes 2-to-1. I was doing this in the past (a limit order above the bid), but I didn’t know what it was called, and I didn’t know the implications of the AON button, either. Great info, thanks! I was reading a different covered call blog, and he has a rule to never write a cc on a pharmaceutical company because you never know when one of their drugs is going to get recalled or fail an FDA milestone – making the stock too volatile. Do you ever write ccs on pharmaceuticals? I do with one caveat. 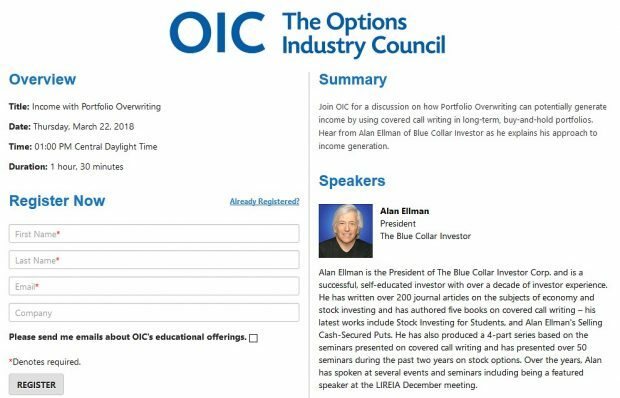 If the implied volatility of an option is extremely high (an at-the-money strike returns > 7% for 1-month as a guideline) I will pass on that trade. This may mean that there is an expected ruling by the FDA on a drug…much like an earnings report increases the implied volatility of an option until the report passes. If you set your goal at a reasonable initial return (2-4% per month for me) you will generally avoid most high-risk situations. The Weekly Report for 11-08-13 has been uploaded to the Premium Member website and is available for download. A weakening in the major market indexes, usually accompanied by poor performance among leading stocks. Under such conditions, the stock market may slip into a correction. 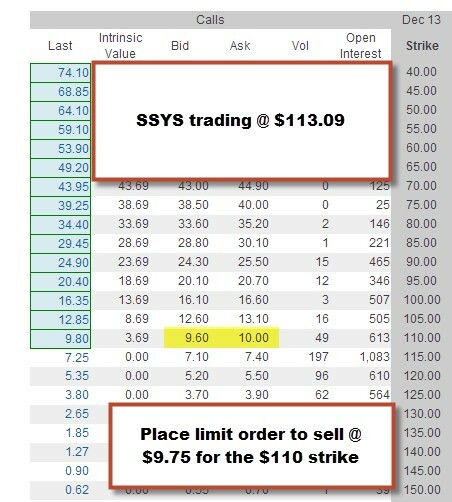 Can we apply the ask-bid spread when buying to close e.g. to roll out? in that case is our aim slightly above the mid point? It appears that you don’t need me anymore! 100% correct. ← The Mechanics Of Leveraged Exchange-Traded Funds: Appropriate For Covered Call Writers?